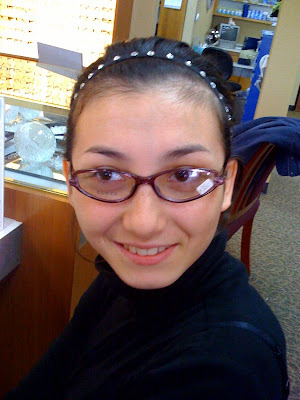 SAMANTHA'S CRAZY BUT LOVELY WORLD: My trip to the Optometrist!!! My trip to the Optometrist!!! Well everyone I got glasses. I went to the Optometrist Thursday because I was having headaches behind my eyes. So Thursday I set up an appointment up with my new optometrist. I had an appointment at 11:30 and got seen around 12ish. I have a lady and she was the nice optometrist I had ever been to.. So anyways she checked my eyes and she told me that my left eye is weaker then my right eye. She prescribed me glasses and I seen some Versace ones, but my insurance didn't cover them.. So I seen this really cute Gucci ones so I ended up getting the Gucci one's. I will not have them for 2 or 3 weeks. So here is a picture of what the glasses look like on me! Christmas is ONLY 3 days away!